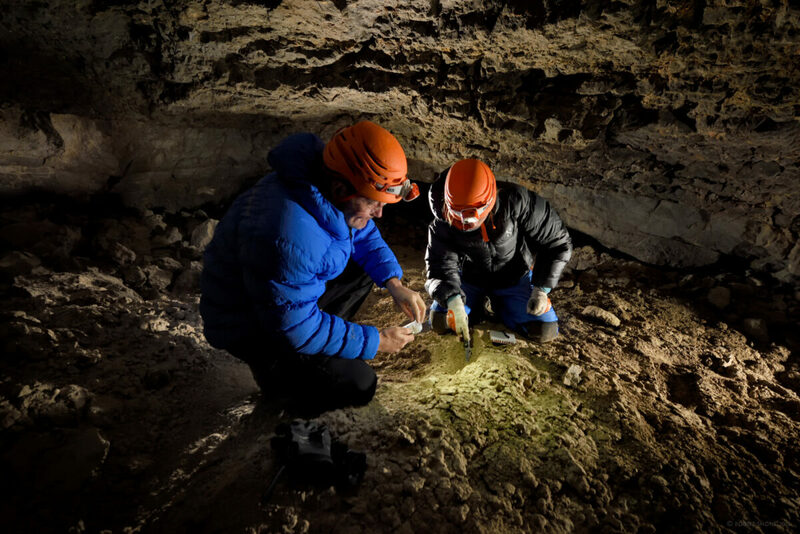 In July and August 2015, Gina E. Moseley of the University of Innsbruck, Austria, led a small expedition of five people to some of the remotest caves on the planet. 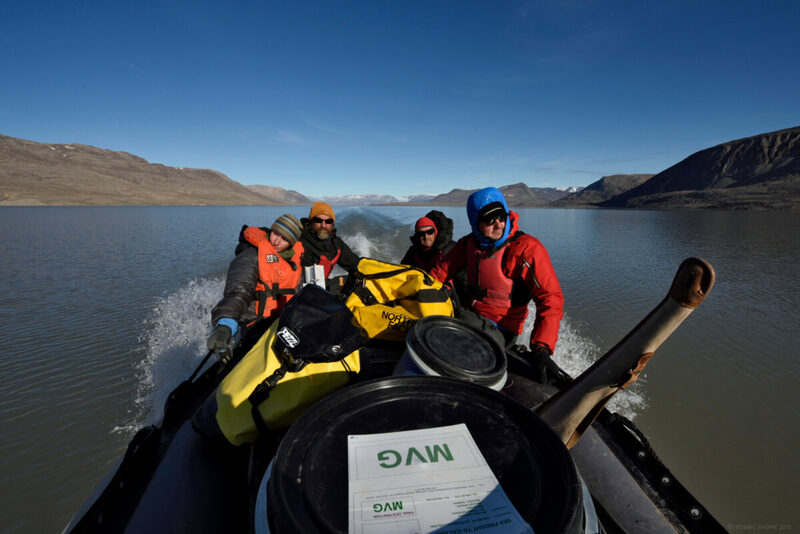 The purpose of the expedition was to collect calcite deposits from caves in the far northeast of Greenland at 80.4°N, which would then be used in valuable climate-change research for the Arctic. Up until now, cave deposit-based climate research has been centered on the tropics and mid-latitudes. 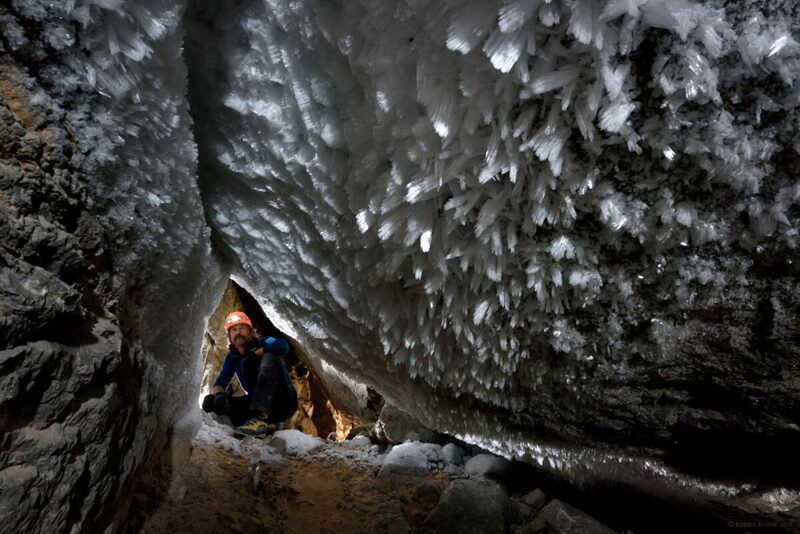 With this research, Gina hopes to construct the first record of past climate change from caves in Greenland. The new record will provide valuable information about how the climate has changed in the Arctic over the last few hundreds of thousands of years, and will also cover a time period that is out of range of the Greenland ice cores. Hence we should gain completely new knowledge about a highly sensitive part of the world. 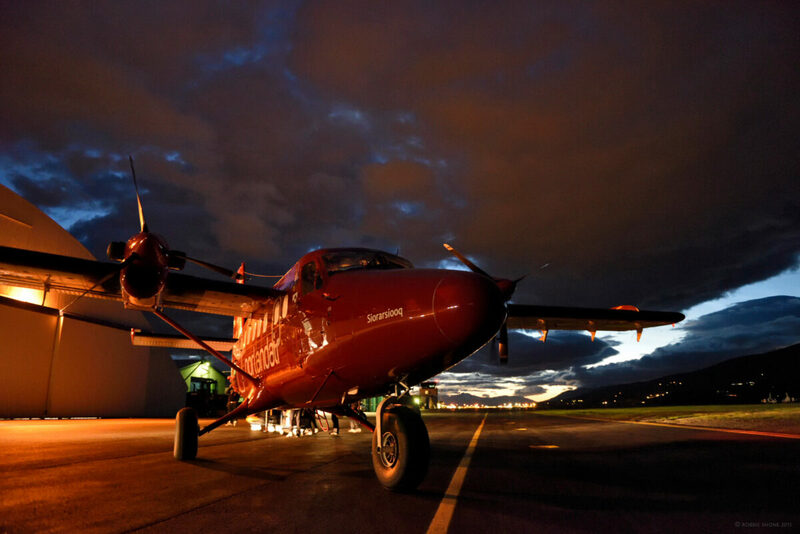 The Nordland Air Twin Otter that our team used throughout our trip to NE Greenland. The expedition took two years to plan. Three weeks were spent in the field, and of those weeks, three days were spent at the caves. The journey was long and arduous and involved spending a couple of days on the east coast of Greenland sorting through equipment. The team then travelled up north for five hours in a Twin Otter, before landing on a small, rough, unprepared landing strip at the western end of lake Centrum Sø. From the bow of the Zodiac 3 inflatable boat looking back eastwards and towards the old base camp the four members of the team, wrapped up in warm waterproof clothing reflect on the expedition drawing to a close. L-R Gina Moseley, Chris Blakeley, Mark Wright and Christoph Spötl. The next step involved inflating a boat and crossing the lake. At first we had some problems, because the water was too shallow, especially for the heavy load that our boat was carrying. In the end, we decided to spend the first night at the end of the airstrip, and then try the boat in a different river to get into the lake. The rest did the team good, and the following day, crossing the lake was no problem. 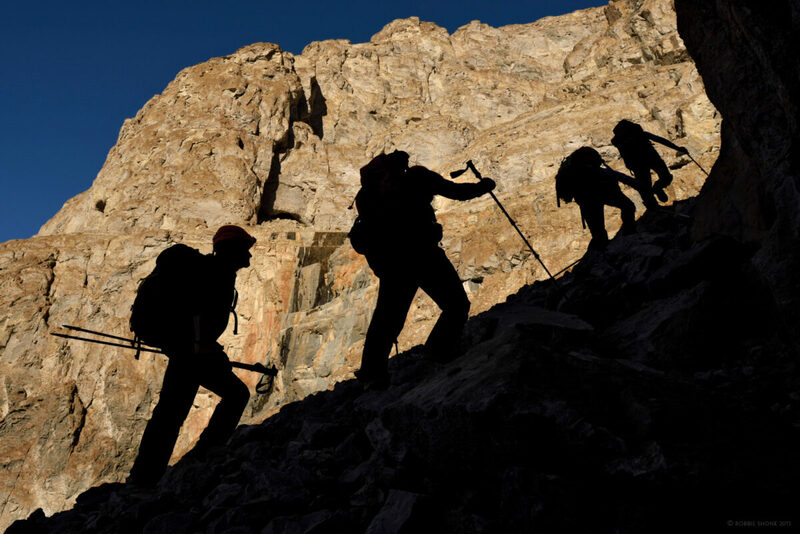 The team set up base camp on the eastern shore, and then trekked for three days to the caves, covering 37 miles (c. 60 km) and carrying 57 lb (c.26 kg) bags. The temperature was much higher than expected, up to 64°F (c. 18 °C), and the mosquitoes were out in full force. After two days of walking, and despite being fully covered and wearing 100 % deet, Gina’s left arm alone had 223 bites on it. Upon reaching the caves, the team set up camp once again. The whole expedition and project was based on an article written in 1960 by two geologists of the U.S. Geological Survey. The original paper described 11 caves, in which one of them contained a 4 inch-thick (10 cm) piece of calcite. Gina’s team had no idea what, if anything, else they would find. It turned out that there was so much calcite present in the caves, as large boulders, as bridges across passages, as thin slithers down the walls, and even lying on the surface with no cave left around it. Silhouetted against the sun bathed cliff, the team of four head up the largest of all the scree slopes of rocks we encounted to a third level on the north west facing cliff face, to check out two large cave entrances that had been reported too dangerous to access without rope. 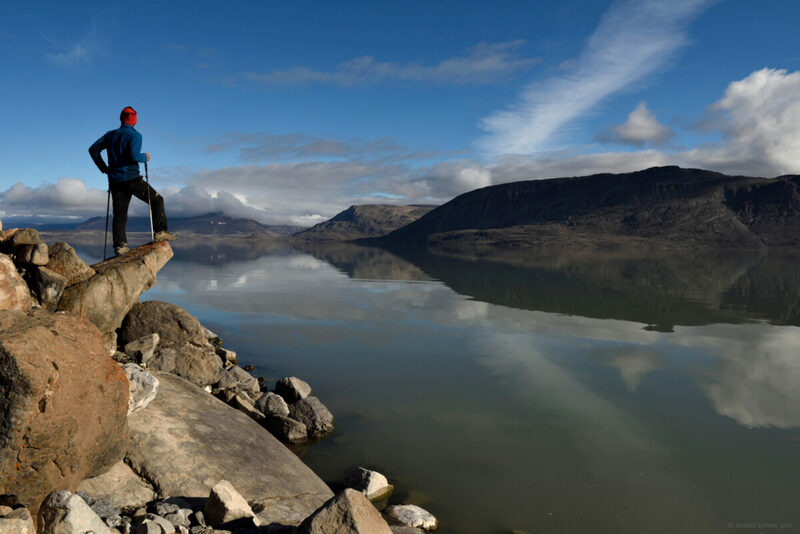 Mark Wright looks out over lake Centrum Sø stood upon a large rock jutting out. Reflections of distant mountains are almost as perfect as the mountains themselves. 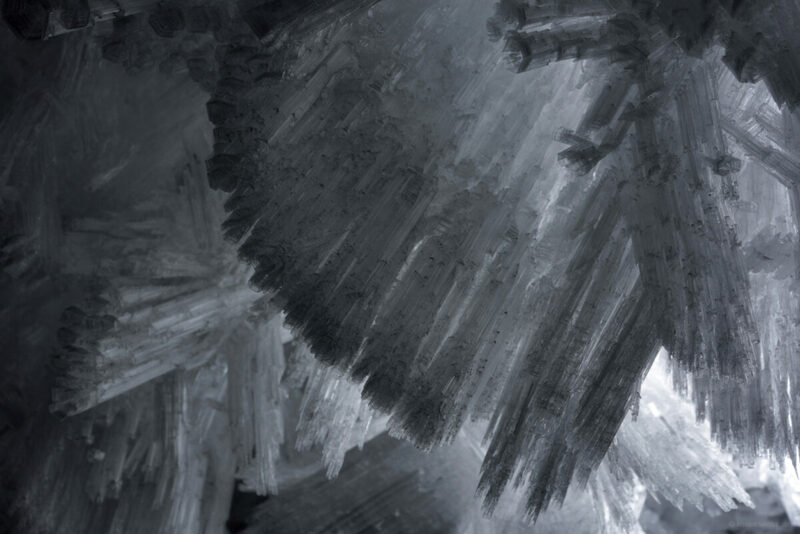 Giant ice crystals clinging to the walls and ceiling of one section midway inside the Crystal Palace. Inside The Crystal Palace at a point where a small sandy ramp dropped down a meter or so, huge ice crystals covered the ceiling and walls. With caution, it was just possible to pass by without destroying this beautiful decoration. Pictured here, Chris Blakeley admires some of the finest ice crystals the team had ever seen. We also noted that the air temperature at this point was several degrees colder compared to the entrance and the very end of the cave. The expedition was always meant as a pilot study, so Gina’s team wasn’t resourced for collecting everything that they found. They had to do the return hike to the lake, and the cave-calcite samples would just be replacing freeze-dried food and fuel. In the end, they collected a broad range of material that represented all the different samples available from these caves. The team hope to be able to build on the results from these initial pilot samples and go back to collect the rest of the record. Besides the calcite samples, the team had many other surprises. They found a note from the original explorers rolled up inside an old yellow Kodak film box that had been stored beneath some rocks in one of the caves. It had a develop-before date of Dec 1961. They also found a dead bird frozen into the ice in the back of one of the caves. It has been radiocarbon dated, and we can’t give too many details away except to say that it isn’t modern! And then finally, when back at base camp near the lake, the team found some old U.S. Army ration with a best before date of 1955. The tins were in a good condition, so we opened one up and found cocoa powder, grape jam, and biscuits. Inside the main ‘U-shaped’ cave. This cave was already visited by people in the past, noted and was one of the specific sites that Gina had based her expedition on. The U-shaped cave turned out to be the largest and longest cave the team found and worked inside during heir stay here. Pictured here, Christoph Spötl and Gina Moseley dig in the floor to collect samples for analyzing in the laboratory. On the whole, the expedition was a great success. Everyone came back unharmed, with some fantastic stories, and of course with some valuable samples that hopefully will yield new information about climate change in the Arctic.